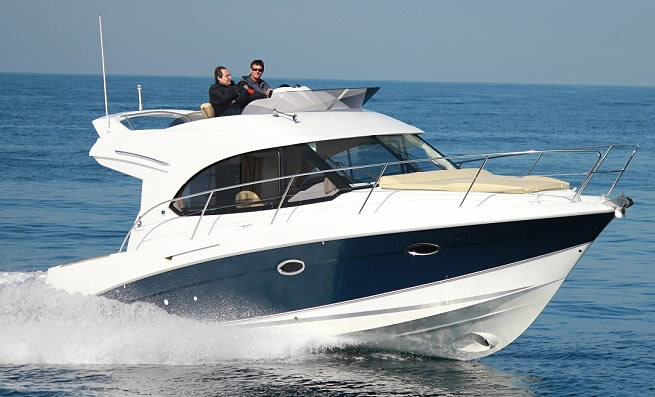 Exceptional sea keeping, ideal for cruising. 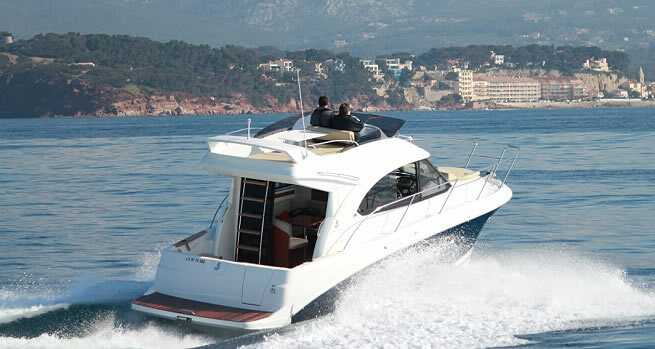 The Antares 32 is the first twin-engined Flybridge in the BENETEAU range, and delivers exceptional responsiveness and comfort at sea for dedicated cruisers. The twin-engined configuration provides much greater manoeuvrability in port and better balance underway. The Sarrazin Design company are behind the modern and sporty lines of this model. A large storage locker is located beneath the large cockpit with its (optional) benchseat. Aft, the comfortable bathing platform and ladder provide easy access to the sea or to the quay. The foredeck can accommodate a pleasant sunbed (optional). On the Flybridge, the layout is well-planned and functional – a comfortable saloon and double helm seat are convertible into a sundeck. Functional and very well equipped galley with hob and gas oven, fridge, microwave, etc. The cockpit can be arranged to suit the choice of sailing programme, with the possibility of adding a benchseat and additional storage units. The Antares 32 has a progressive planing hull ensuring well-proven performance, and reassuring stability given by the pronounced ″V″ forward and a type of flared bow for a top speed of 26 knots with the 2 x 200 HP Nanni engines version.